The recipe I promised in 'My Sunset Magazine Moments' post. I have been making this soup for years...It's a Flashback from the past. 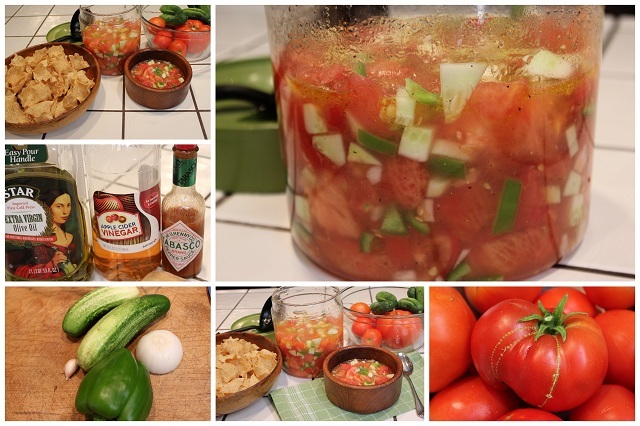 West Coast Gazpacho Soup is easy and refreshing for a simple lunch or to accompany a wonderful steak for dinner on the patio. This old scale has been in the kitchen since the early 70's when the whole yard was garden. Click Here to see the yard in 2011. We love to have Gazpacho soup for lunch with some chips and fresh fruit. I love this container to store the Gazpacho in the refrigerator. It's glass and has a large opening for easy access with a ladle or large spoon. I was doing research on Gazpacho Soup and discovered this is a popular cold soup in Spain. Please link up and see whats going on. Oh this looks absolutely refreshing! This could be the reason I don't want summer to end! That soup looks so tasty! Thanks for sharing that healthy recipe. I'm visiting from Foodie Friday. We love gazpacho soup and I've recently made several versions, including one with mango. It's such a healthy and fresh soup. Fabulous for summertime. I agree with Amy. I don't want summer to end. Awesome flashback! I will have to give that one a try. Sorry it took me so long to comment but I was on vacation.